MyRA program to be discontinued. Out of town meals allowed as de minimis fringe benefit. California expands earned income tax credit. Cash basis landfill can deduct future clean up costs. Deduction disallowed for repayment of a loan. Refined coal credit not allowed for investors. Trader must use first-in, first-out accounting for sales of investments. 401(k) loan was taxable when payments were missed. Farewell to Financial Insider Weekly. Minerva Siemer celebrates her 5th birthday. It's hard to believe, but summer vacation is almost over and most children will be back in school by the end of August! Please drive carefully and enjoy your end of summer activities! August is a month with many celebrations for my family. 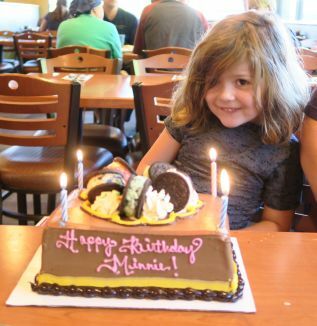 Minerva Siemer, who is Dawn's daughter and my granddaughter is celebrating her birthday (and starting kindergarten!) this month. My sister-in-law, Gail Johnston, is also celebrating a birthday. Janet and I are celebrating our 46th wedding anniversary during August. We consider ourselves blessed in sticking together through good times and bad times - mostly good. The Treasury Department has announced the myRA program initiated under the Obama administration in 2015 to build retirement savings for low to middle income earners is being discontinued because of low demand. Out of town meals allowed as a de minimus fringe benefit. The Boston Bruins provided pregame meals through hotels to team members and personnel when they were travelling for games away from the team's home location. The pregame meals were mandatory and the players used the time to meet with coaches, review game video, and discuss public relations. The team management, coaches and trainers met during the meals for planning and making roster adjustments. The S corporation that owned the team deducted the full amount of the meals. Jeremy Jacobs was the owner of the S corporation. The IRS claimed the meals deduction should be limited to 50% of the cost. The Tax Court ruled in favor of the taxpayer, that the meals qualified as a fully deductible de minimis fringe benefit. (1)	The eating facility is owned or leased by the employer; (2) the facility is operated by the employer; (3) the facility is located on or near the business premises of the employer; (4) the meals furnished at the facility are provided during, or immediately before or after, the employee's workday; and (5) the annual revenue derived from the facility normally equals or exceeds the operating cost of the facility. The last requirement is waived if the employee is entitled to exclude the value of the meal provided from taxable income. This exclusion applies when meals are provided for the convenience of the employer "for a substantial noncompensatory business reason of the employer." The Court found the arrangement with the hotels to provide the meals met the "leased" requirement and if an employer contracts with another company to operate an eating facility for its employees, the facility is considered to be operated by the employer for this purpose. The case is significant, and employers should discuss it with their tax advisors and review the status of their deductions for employee meals, including segregating meals that are 100% deductible as an employee fringe benefit on their accounting records. In the past, California only allowed an earned income tax credit for wage income subject to California withholding. This excluded domestic workers whose income wasn't subject to state income tax withholding. SB 106 expands the definition of "earned income" for the purposes of California's earned income tax credit to include self-employment income, effective for taxable years beginning on or after January 1, 2017. Governor Brown has approved the 2017-2018 budget, which includes some California tax changes. Effective July 1, 2017, the duties of the California Board of Equalization have been changed. The tax appeal duties have been transferred to a new Office of Tax Appeals. Beginning January 1, 2018, the Office of Tax Appeals will conduct all income and franchise tax appeals. There are also some changes to the excise taxes and cultivation tax for marijuana, which are beyond the scope of this newsletter. The Tax Court ruled against the IRS and in favor of a cash basis taxpayer that an election was available to currently deduct estimated future cleanup costs for a landfill under Internal Revenue Code Section 468, even when costs would be paid in the distant future. The IRS claimed the election is only available to accrual basis taxpayers. A medical center made a loan to a surgeon as a recruiting incentive. The surgeon claimed a tax deduction for a partial repayment of the loan. The IRS disallowed the deduction. The Tax Court ruled in favor of the IRS. The loan was legitimate, and evidenced by a promissory note. The surgeon didn't report taxable income for receiving the funds. Repayments of principal on a note aren't tax deductible. The IRS Chief Counsel found investors weren't producers with a meaningful financial interest in an underlying production facility, so they weren't entitled to refined coal credits that they purchased. The arrangement was structured so the investors would have small, limited losses on their capital contributions, which weren't attributable to the production of refined coal. The transaction was structured solely to generate tax benefits. The general rule is investors are considered to sell their securities according to the earliest acquisition date (first-in, first-out). Taxpayers can make an election by giving instructions to their broker that the last-acquired securities are sold first (last-in, first-out), or specifically identify which securities are sold. A taxpayer, who was a day trader, tried to use the last-in, first out method, but wasn't able to prove he had given instructions to the broker. He wasn't able to give the instructions because of an error on the broker's web site, even though he followed up with telephone calls. The Tax Court ruled against the taxpayer. The taxpayer didn't meet the objective burden of proof. An accuracy-related penalty was also assessed, which could have been avoided if the taxpayer reported or sought a correction to the Form 1099-B issued by the broker using the first-in, first-out method. An individual borrowed a loan from her 401(k) plan. When she was on leave without pay, she failed to pay two of the installments on the loan. The Tax Court ruled that despite making up the payments later, the loan became taxable income as a distribution from the plan and was also subject to the early distribution penalty. We generally discourage borrowing money from your 401(k) plan. It's just too easy to mess it up. After eight years of production, I am discontinuing producing new interviews for Financial Insider Weekly. Doing the show has been a rewarding experience and I consider back episodes to be my legacy of financial literacy education to our community. Past episodes are available at https://www.youtube.com/user/financialinsiderweek. Financial Insider Weekly broadcast schedule for August. Financial Insider Weekly is broadcast in San Jose and Campbell on Fridays at 9:30 p.m., Pacific Time, until August 11, 2017. The final episode will be broadcast in San Jose and Campbell at 6:30 p.m. on Thursday, August 24, 2017. You can watch it on Comcast channel 15 for San Jose and Campbell. The show is broadcast as streaming video at the same time at www.creatvsj.org. August 24, 2017, James O. Brown, ASA, CFP®, Perisho, Tombor & Brown, PC, "The role of the business valuation specialist"
Past episodes of Financial Insider Weekly are posted on YouTube. One way to watch them is to go to our web site, www.financialinsiderweekly.com, and click on "Past Episodes."